Swimming laps in a public rec center, you get to see a lot of mostly naked old people. At first, it's kind of disgusting, seeing the reanimated corpse of Strom Thurmond paddle past you wearing nothing but a marble bag. But eventually, you find the ability to ignore what he's wearing. Because I actually think he'd look a whole lot funnier wearing a pair of those oversized swimming trunks that the young hooligans wear. Not to mention that old Strom is there every single morning at 7 AM to get a good lane. That takes dedication. You get a whole different crowd if you go in the evenings. Twenty-something guys who drink six Red Bulls beforehand and make thrashing love to the water, splashing everyone within three lanes of them with their pelvic thrusting "butterfly" maneuver. Or the old guy who does "calisthentics" at the far end of the pool with his crotch pressed up against the pool vent. But which ever time you go and whatever crowd you swim with, the fact remains: people who use the public rec center pool are endlessly entertaining. Men always have to do some elaborate stretching routine before entering the water. Either the Michael Phelps arm flap or some knee bend thing while gripping the ladder with one hand. Women tend to get right down to business, whether the business is the world's slowest dog paddle down the middle of the fast lane or a solid hour of freestyle. There are big people and small people. There are people who are old and people who are young. There are people who seem to have taken a left instead of a right at the ping-pong tables and appear to be drowning. And still others who just like to sit on the edge of the pool and fiddle with their goggles for an hour before finally just getting up and going home. And then, there are the lifeguards. I'm not quite sure I would put my life in their hands if it came to that. At the pool I visit in the evenings, the lifeguard sits with his lap full of Chinese takeout and sometimes wanders back into the staff office, rather than keeping an eye on the swimmers. Which is lucky if an eggroll starts to drown but unlucky for someone with a leg cramp. But if someone did actually call for help, I think he would gladly loan out his water wings. So there's that. In the end, the most important thing is to do your giggling with your face under the water. Lift up your goggles before administering death stares, or no one will see it. And stay away from Strom's marbles. If you have any additional concerns or questions, please don't ask the lifeguard. He is out in the hallway ordering pizza. oh my god, men swimming at the public pools - everyone's a michael phelps!! they all have the swagger when they walk in, the stretches, the laps. of course, if you ask any of them if they're a fan of him, they will say NO. but they all want to be him. and let me get this right, if you are seeing old man strom swimming at 7am, that means that you are there at 7am? meaning, you get up early to swim when you could be sleeping in?! for realz? mad props. 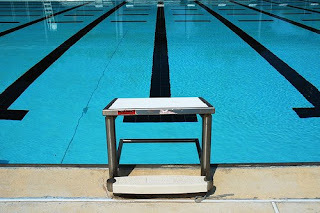 and the only pool rule i can remember is a sign on the side of my grandmother's pool: "welcome to our ool. notice there is no P in it. let's keep it that way." ahh, good times. @ayl: Nah, I get there at 7:45 usually if I swim in the morning. But Strom is ALWAYS there when I arrive, so I theorize that he's there at 7. The thought of reanimated Strom Thurmond in a Speedo both terrifies and amuses me immensely. Believe me, it's as scary as it sounds. does your pool have a swim up bar? otherwise, i don't see what is so important at 7 am. @M: Gun maintenance. I gotta keep my guns in shape.